In reality the root of the current refugee crisis in Syria lies in the strategy of “regime change” adopted by the West over many years. After its failure to effect regime change in Syria, the West now appears intent on ruthlessly exploiting the misery of the Syrian people that the West itself has contributed towards creating in the first place, using the human desperation as the latest leverage to weaken and inflict a final defeat on a country that has been outside its control for decades. From this perspective the generous German ‘offer’ to take in 500 thousand Syrian refugees a year can be interpreted as a cynical strategic ploy to persuade the Syrian population to break their attachment to Russia’s last remaining ally in the Middle East; thus bribing a desperate people weakened by years of conflict. Such an enticement to escape from increasingly intolerable conditions will effectively decant Syria of the most able-bodied members of its population, who will be vital to help rebuild its economy in the future. This new tactic seems to be working where sanctions and sponsoring terrorism have failed. Many of the refugees now fleeing the conflict are apparently former members of the Syrian armed forces who have simply become exhausted and had enough of the relentless fighting; this reduction in military personnel is seriously depleting Assad’s ability to resist ISIS. Meanwhile, US Secretary of State John Kerry has threatened Russia for its alleged military ‘build up’ in Syria and NATO has inevitably echoed Kerry’s concerns. These accusations of an increased Russian military presence in the country conveniently ignores the longstanding cooperation between Moscow and Damascus and flagrantly dismisses the significant role that Russia is playing in assisting Syria to combat the advance of ISIS, which is supposedly the main rationale for the current US-led military operations in Syria. Perhaps we must conclude that the West is not very serious about defeating ISIS or at least that it sees removing Assad as the top priority irrespective of the consequences. Washington does not even have a plausible puppet government-in-waiting to take the reins of power should Assad be toppled; the political vacuum is much more likely to be filled by ISIS. Surely the West’s policy advisers understand this is the all too likely outcome. 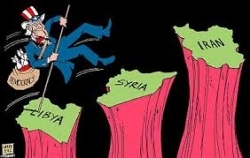 Tightening the noose on Russia and Syria, EU states Bulgaria and SYRIZA-led Greece are now denying Russia the use of vital airspace to supply Syria, which is clearly a further calculation designed to weaken Damascus – although Iran has offered Russia an alternative flight route. Furthermore, it needs to be stressed that, as has been widely reported, the so-called “moderate rebels” so assiduously promoted by the US are actually linked to Al-Qaeda, which makes for an unholy alliance if ever there was one. The end result of the conflict in Syria could be that ISIS will come to rule and it could even eventually head a pro-Western state. This outcome is not really so farfetched if one considers the repressive nature of some of the West’s other long-term allies in the region and around the world. Washington and the European powers have never really had a problem in dealing with dictators despite all their high-minded talk of human rights in this and in other contexts. Human rights discourse is simply another weapon in a strategic power game. Another front in the war against Russia is Ukraine, which has been transformed into one of the most anti-Russian regimes in Europe and sees the extension of NATO right up to Russia’s border. NATO has been broadening its presence in Ukraine for some time but is making this new military relationship more formal with an official visit to Kiev by its Secretary General Jens Stoltenberg who was to take part in the Ukrainian Security Council. At the same time, Ukraine’s Foreign Ministry indicated that the opening of the very first NATO office in Ukraine is planned. Furthermore, Mikhail Saakashvili, the virulently Russophobe former president of Georgia, who is already the governor of Odessa, is now even being touted to become a future Prime Minister of Ukraine; which can only be interpreted in Moscow as a gross provocation. Elsewhere, NATO member Turkey seeks to smash the Kurds who are not only officially branded as terrorists by the EU and US, but are seen as suspiciously socialist and subversive of the existing neoliberal order. Turkey has been allowed to launch bombing raids on PKK camps in Northern Iraq, which the UN Secretary General has defended on the basis of the country’s right to self-defence. It needs recalling that Turkey was supposed to be joining the US-led campaign against ISIS but instead it preferred to use the occasion in an opportunistic manner to attack the PKK which it sees as its main enemy, while it has been accused of aiding ISIS advances, particularly in the case of the Kurdish border city of Kobane which had come under sustained attack from ISIS. Ironically, it speaks volumes that the US is remaining largely silent and uncritical in face of the mounting death toll arising from Erdogan’s decision to abandon his rapprochement with the Kurds in favour of what increasingly looks like escalating into an all-out civil war. The West seems none too bothered about this outcome. We hear only muted complaints, for instance, when independent journalists are picked up and deported by Turkey. In marked contrast to the criminalisation of the Kurdish movement in Turkey, the Kurdistan Regional Government (KRG) of Iraq, which has always been tenaciously pro-Western, was fulsomely praised in Parliament by PM David Cameron on 7 September during the debate on Britain’s policy shift on taking in Syrian refugees in the wake of the outcry at the death of the Kurdish boy washed up on the shores of Bodrum, in Turkey. This praise for the KRG is meant to teach the PKK and its affiliates in Syria a hard lesson: they are being warned, ‘embrace our ideology and you will prosper, defy us and Turkish aggression will be mercilessly unleashed and we won’t help you’. The social confrontation now raging across Turkey has seen violent attacks on Kurdish organisations such as the burning of offices of the HDP, which led one commentator from Turkish Daily News to describe it as an impending Turkish ‘Kristallnacht’. The conflict now raging in Turkey was initiated by President Erdogan after his failure to achieve a much sought absolute majority for his AKP in the country’s June election. Frustrated by the election outcome, he has since sought to find a means to reverse the setback setting his sights on the HDP whose surprise 14 percent in the poll denied Erdogan the victory which he virtually believed was in his grasp as a destiny. Hence, his increasingly erratic, manic and messianic approach to politics. This has laid the basis for an unnecessary conflict that might easily have been averted given the potential to build on all the efforts that had been put into the peace process with the Kurds. Sadly, a magnanimous and more imaginative politician who was truly concerned for the entire nation’s welfare rather than narrow party interest might have achieved a historic breakthrough. Tragically wise counsel from Turkey’s allies seems not to have been made available or at least what had been attempted has proved to be ineffective in deterring Erdogan from his destructive trajectory. There are fears that a deal had been struck between US President Obama and Erdogan to allow Turkey to sort out its Kurdish problem by force in exchange for permitting the US use of Incirlik airbase to bomb Syria. If the assumption that this is what was agreed is correct, the responsibility for the renewed conflict would lie not with Ankara alone. Not only will this be another ‘great betrayal’ of the Kurds by the Western powers, it will amount to a huge miscalculation in that the Kurdish social movement cannot simply be eradicated by employing force, however brutal that might be. This bloody course of action will simply contribute towards the further destabilisation of an extremely unstable region. The social conflicts inside Turkey will not easily be healed, but, in fact, they may well last for generations, significantly weakening the country in the meantime. Incidentally, it might also be mentioned that some of the Gulf States, who are ‎generally backing the “opposition” to Assad financially and diplomatically, are also seeking to gain an economic foothold into Ukraine by buying up tracks of fertile agricultural land, of which the country is plentiful, to obtain vital food resources to satisfy the needs of their own growing populations. In addition, Qatar has recently played host to a conference of the so-called Iraqi opposition – with US support- one aim of which was to unite former Baathists and pro-ISIS groups in Iraq in a bid to change the government in Baghdad. This is yet one more zone of engagement in the wider confrontation. The US has also found it impossible to renege on the Iran nuclear deal, but lobbied by its traditional allies in the region, Washington still seeks to contain any possible expansion of Tehran’s influence. UK leaders demonstrate a similar negative attitude to Iran reflected in their reluctance to condone its involvement in any deal to resolve the conflict in Syria. Thus, replying in the Parliamentary debate to a call by Labour MP Jeremy Corbyn for an international conference on the Syrian crisis that would include Iran and Russia, Cameron was quick to remind MPs that Iran remains disqualified because of its alleged continued support for “terrorist” organisations such as Hezbollah in Lebanon. 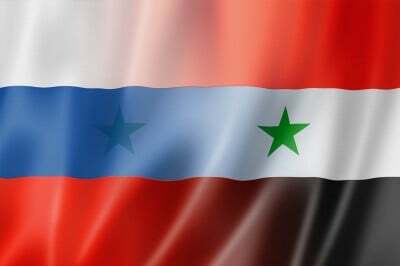 This casual and routine repudiation of any proposals for peace talks to resolve the conflict only works to prolong the misery of the Syrian people whom the likes of Berlin and Brussels are currently proclaiming to offer a place of refuge. There is a certain contradiction here and the hypocrisy is quite nauseating. Syria, Ukraine, Turkey, Iraq and Iran. These are seemingly separate conflicts with different causes and their own self-contained solutions, but underlying them there is a grand plan which is to exert control over a strategically vital region and by so doing gain possession of its rich resources. These conflicts are related zones of engagement within this overarching conflict. It amounts to an undeclared world war.